Eleanor Pratt adored her teenage grandson, Robby. What he lacked in ambition he more than made up for in thoughtfulness. Because Eleanor wanted Robby to attend college, she made a deal with him: She would set aside money to pay for his college education; but if he didn’t end up going, he wouldn’t receive those funds. To help accomplish her goal of motivating Robby without losing control of those assets – and at the same time invest for growth and achieve some key tax advantages – Eleanor’s financial advisor recommended a 529 college savings plan naming Robby as its beneficiary. The 529 college savings plan offers a practical estate planning option for grandparents, like Eleanor, who would like to help pay for their grandchildren’s college expenses. Contributions are considered a gift to the beneficiary and, once deposited into a 529 account, those assets are no longer part of your taxable estate. There’s also an option to contribute a substantial lump sum without triggering gift taxes. In fact, Eleanor (and other grandparents like her) can contribute five times the annual $14,000 gift tax limit with a five-year election – up to $70,000 or $140,000 from a married couple in 2014. That way the larger investment has more time to grow over the years. Grandparents may contribute to a 529 that has already been established by someone else, such as the student’s parents, or open one on their own. The advantage of opening your own account for the benefit of a grandchild is that you retain control over the assets and can access them at any time. 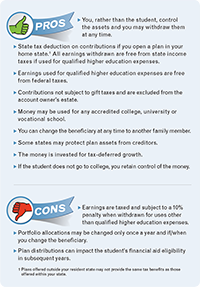 In addition, unlike the parents’ 529 plan, when the account is owned by a grandparent it has no impact on the student’s financial aid eligibility. Bear in mind, however, grandparent-owned 529 plans are technically considered a gift to the student and treated as untaxed income – so distributions can impact the student’s aid eligibility in subsequent years. The student beneficiary may choose any accredited college, university or vocational school anywhere in the country, and the account beneficiary may be changed to another grandchild if the student drops out or does not use up all of the funds by graduation. One thing to note is that your grandchild may not indiscriminately withdraw from the 529. You own the account and control how distributions are used. In terms of estate planning, the ability to gift a tax-advantaged investment and retain control is pretty unique. Most 529 plans allow you to reclaim the funds for yourself for any reason, so the account also can serve as a back-up emergency savings plan for you. Note, however, that the earnings portion of any withdrawals not used to pay for the beneficiary’s qualified college expenses will be subject to income tax and an additional 10% penalty tax. Another advantage to owning a 529 is that you won’t have to manage that money as part of your own investment portfolio. You simply complete the enrollment form and select a preset allocation based on the beneficiary’s length of time until college. That fund allocation is professionally managed either by the state treasurer’s office or a third-party money manager. More students are able to attend college today than in the past, but for some it means taking on student loan debt. Like Eleanor Pratt, many grandparents would like to see the money they plan to leave as an inheritance put to good use while they’re still alive. At the same time, it’s important to ensure you still have control over these assets in case you do need them. 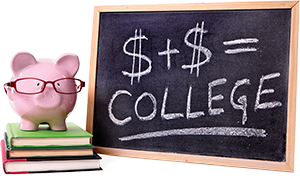 I can help you determine which type of education savings account can help you accomplish this goal.